Some of the readers expressed curiousity & interest in the action of hitting a man with a shebsheb zanouba ( if it is not them I guess ) especially after they found out that those are rubber flip flops ;) - the common species of rubberis flip floppus excuse my Latin. Well here is a prime example , Highlander's own shebsheb ( ain't that better than my poster? ), you already saw my boots ! NBA wants a contest of shebshebs ;) or footwear , Leilouta already has a nice collection of footwear online ......, Programmer _Craig may show us either his feet or his boots ( if he does not chicken out at the last minute he he he), Redenclave has already put her favourite sandals . Dear readers and bloggers : If you want to add more to the collection of 'show us your footwear !' you are welcome ...lol. Safia has shown her footwear and her foot problems a few days ago :). While Roba went shoe shopping ..and we learn she 's got gorgeous toes . The funniest of them all though is NBA, he has kept his promise and sent a photo to publish on the blog and share with you all + what he calls an essay to go with it , which I had promised to post so you will all have to enjoy his prose - quite educational :) Thanks NBA lets hope this will encourage you to blog ! "Non-Blogging tries to be barefoot as much as possible. As this is a blog frequented by many decent Muslim ladies, out of respect for them the kafir Non-Blogging, however, prefers to show here as little of his desirable but haram fair skin as possible. 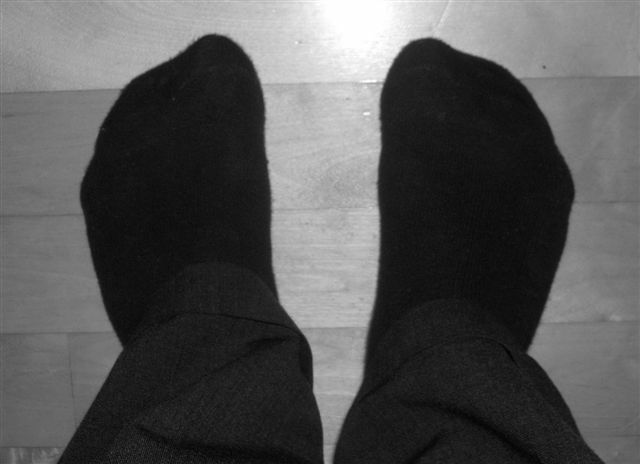 His feet are covered here by mustat sukat [black socks] and his legs by housut of the suorat housut [trousers] sub-species commonly worn by people in the Western cultural sphere in professions where the risk of getting sweaty or greasy is minimal.Mustat sukat have little use in disciplining unruly women except for when they are left lying on the floor waiting for the next hottie passing by to hold her nose and pick them up. Furthermore, they can be used in symbolic mental torture due to the fact that mustasukkainen in Non-Blogging?s native language means both jealous and literally black-socked. Wearing jealous black socks is the worst aggression a Euro-softie like Non-Blogging could ever think about.Last but not least, Non-Blogging insists that such trivial things as flip-flops sound boring in English but bear the scent of Oriental mysticism when referred to as shebsheb zanouba. He thus hopes using his native terms here brings the readers a scent of the cold, formerly invincible North now gone soft." It's hard trying not to smile and LOL reading all these most recent posts on this blog. This all is becoming weird but I like it :-)! Should we all send pictures of our footwear here? I owe no flip flops, though ;-). For all of you who didn't notice it yet, yes, everybody's favourite Tunisian-American blogger is finally back from her hiatus!!! HL, I like the zeleiz in the picture more than the flip flops :) Haven't seen that in a long time! BTW, isn't shebsheb zanouba an Egyptian term? We call it shebsheb esbe3 (toe's shebsheb) in the east. Highlander, did you realise that we need to keep on reloading our blogs. I didn't realise that you have enter 2 entries until now which is 2117 HK time (+8). Nice flip flops & very shiny marble floors. Too bad I no longer own flip flops. I used to own an all black one, looks great with jeans! Never hit anything with it though! Should i try doing so? Especially when men with octopusy arms come along!! To everyone who loves pumpkin and its family, the Curcurbita Dynasty. Disciplining unruly men, oh, my my, I love that. Just let me say it again, di-sci-p-li-ning un-ru-ly m-en. Highlander darling, that is the best thing I’ve heard in ages. I tell you, I can see loads of bottoms, oh, oh, I mean men, need disciplining around here, hehehe. Hmm, and yours just looks perfect for the job. 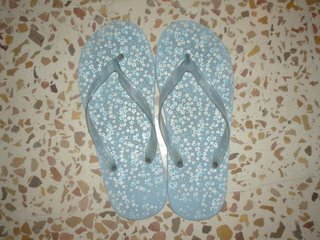 Actually I’ve got two filp flops, one for showers and disciplining imaginary men, the other for the beach, hehehe. Oh yes, I remember the one with a daisy on top. I had one with an orange daisy, how Libyan!! Honestly and I fought fiercely with my sister over it. I was sporting that filp flop with an orange daisy, plus the few cuts and bruises inflicted by my very nice sister, for the whole summer. I’ve never felt proud in my life prancing in front of our house with that daisy flip flop, I swear. 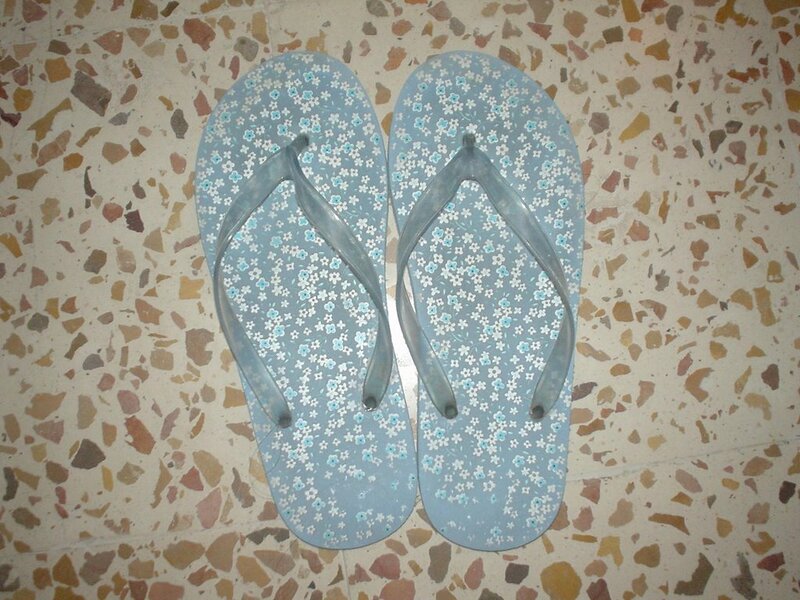 I want a filp flop with a daisy, I want a flip flop with a daisy, boohoo. Highlander habibti, walahi, I’m dying for a real Libyan Gherma, especially if it involves Taghti3 wa Teryyish, oh, oh, my favourite food. LOL, LOL I might give you a buzz this weekend, depends on the mood and the budget, hehehe. Craig, I’m still waiting for the song/video, just don’t forget to wear a cowboy hat and boots. I told you, I have a big soft SPONGE for Yankees, hehehe. Pumpkin, why not send a picture of your shebsheb zanouba to Highlander and have it posted here? The readers could then decide which one of you two Libyan hotties has hotter flip flops ;-). 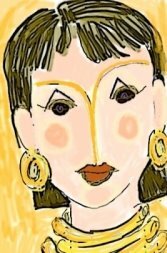 Hanu yes we say shebseb sobu3 as you said about the zanouba shebsheb, I think along the Egyptians, the Sham people say Zanouba . I used it sarcastically in a sense where the word shebsheb zanouba and swatting someone with has become idiomatic from Arab movies :) Every Arabic speaker can identify with it. Hanu I love our zeleiz and probably cannot survive without it for a long time . Is it available in the US ? I love flipflops. I am wearing some right now. I wear them most of the time especially on the weekends and after work. I even work out on the trademill in them.I find it much more comfortable than sneakers but my husband thinks I am crazy because of it. BTW, I learned not to wash the floor with flipflops…too dangerous for me…I clean in barefeet. Craig, I guess we had something similar as well. Grey, rubbery, though I don't remember if we had this thing Highlander's shebsheb zanouba has between the two toes or not. I don't either remember what the official name for the thing was but in the conscript slang they were called p**s skates (we have decent ladies reading here but the word I'm censoring refers to urine ;-)). If somebody doesn't get the joke, it's a reference to the presumed unhygienic condition of a shower room and toilet shared by way too many idiots. Instead of flip flops, I put on this real cool sandal by timberland. It's very comfy & rugged. NBA , you can say we use the Arabic in the midst of sentences to be kinda cool in way ... I never thought about it but now that you are asking yes it is more fun - ads spice. Look at yourself if I had used the term flip flops or slippers you would not have said anything but the moment there was a word you do not understand ;) the attention span spiked up .... we all like a little mystery . I beat you days before! This won't go unpunished, Highlander. Get prepared for an invasion of broken English mixed with a variety of languages on your blog from your readers who want to sound more cool and mysterious than they really are hehehehe... How many different native tongues do we have here anyway? Hehehehe, as for alphabets we have at least Arabian, Latin, Cyrillic... Craig, you write Cantonese, too? By the way, is zeleiz the floor you have under the shebsheb zanouba in the photo? (Ah, I start sounding like a cool Arab blogger ;-)) Hope you won't ever hit Mr. Highlander with that. I can manage with Arabic, Latin and Cyrillic ;)NBA I might have a problem with Cantonese , but Pumpkin may help ? not sure .....yes zeleiz is that floor. NBA, there is no written form of Cantonese, it's teh same as Mandarin written in Kanji. And no, I can't scrawl a single Kanji character! My ex-wife could only write Chinese because she lived in China til she was 14. Her younger brother and sisters can only speak Cantonese and Mandarin, they can't read or write it. As is the case with most Chinese immigrants, by the way. It's a very difficult language, in written form. Now where are all the comments here praising my gorgeous legs and cute warm socks? I need attention ASAP. Non-Blogging, dude u might b soft but ure really funny! Now with such initimate photos we can soon figure out your IRL identity. Actually who would have thought that HL's offhanded remark about punishing men (in such a cruel way) would lead to all these comments. So if Arabic in the middle of sentences is so cool then how hyvää rakaasta Soumi rnt some other secret languages! haha. I love Zanoubas!! (although we just call them osba3 here) They're awesome. When can we see the backs of all the Libyan bloggers, eh? I'm going to see if I can find a pair of my old olive drab "combat socks" from the marines to model for Highlander's blog! They have reinforced toes and heels and are really think scratchy wool! You can't find such uncomforable socks just anywhere, you know!